In the days when you can carry a device in your pocket which can access not only a map of the whole globe but satellite images of the earth’s surface, it is hard to imagine life without easy access to accurate maps. Historic maps are fascinating and often beautiful documents, and the Essex Record Office holds many maps which help us to tell the story of our county’s past. Some of these maps have been well treated and survive today in good condition, perhaps a little faded and worn but largely complete. Others, however, have not been quite so lucky. Regular readers may remember that in spring 2012, a dirty, tattered piece of parchment was found in a farm outbuilding in Wendons Ambo, near Saffron Walden. 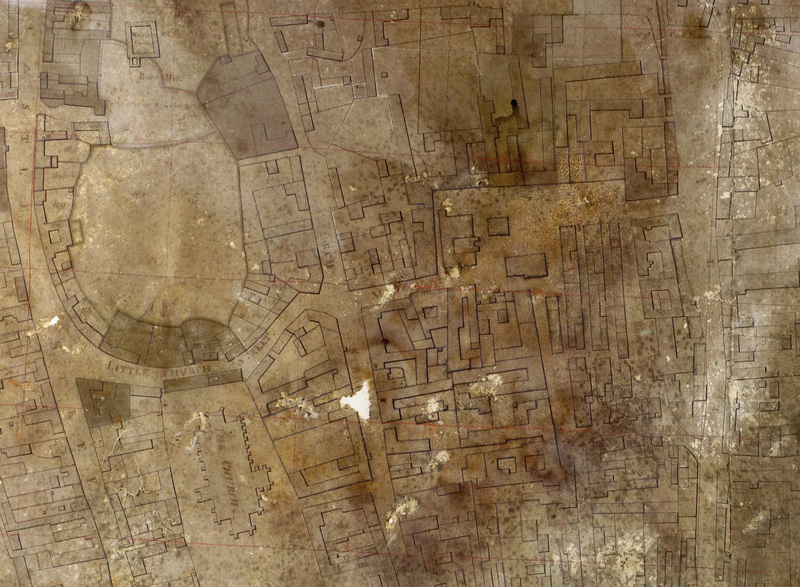 Upon unrolling it, it was discovered to be a map of the historic town ofSaffron Walden, dating to 1757. This makes it the earliest known map of the town. This is a very special find, showing in great detail the historic centre of Saffron Walden, much of which survives today. Before conservation work. The map was brittle, dark, mouldy, and peppered with small tears and holes. The map was made by Edward John Eyre, whose slightly later, larger 1758 map of the area around the town may well already be familiar to Saffron Walden residents. It is likely that both maps were commissioned by Elizabeth Countess ofPortsmouthor her nephew, Sir John Griffin Griffin, who inherited part of the nearby estate of Audley End. 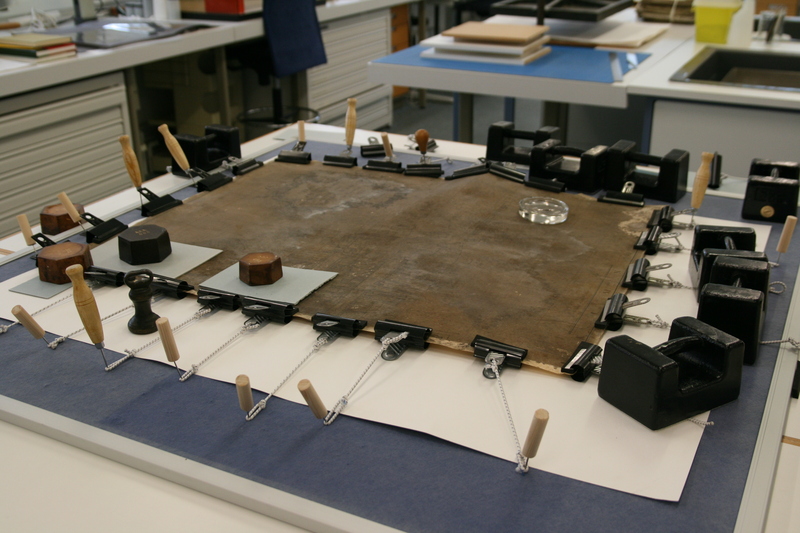 In June 2012 the map was transferred on permanent loan to the Essex Record Office for conservation work and storage. Despite the degree of damage it has suffered, the hand-drawn streets and buildings are still remarkably clear. Since the map arrived at ERO, our expert conservators have worked to stabilise the map to prevent any further deterioration, and have made any repairs possible. During conservation work. 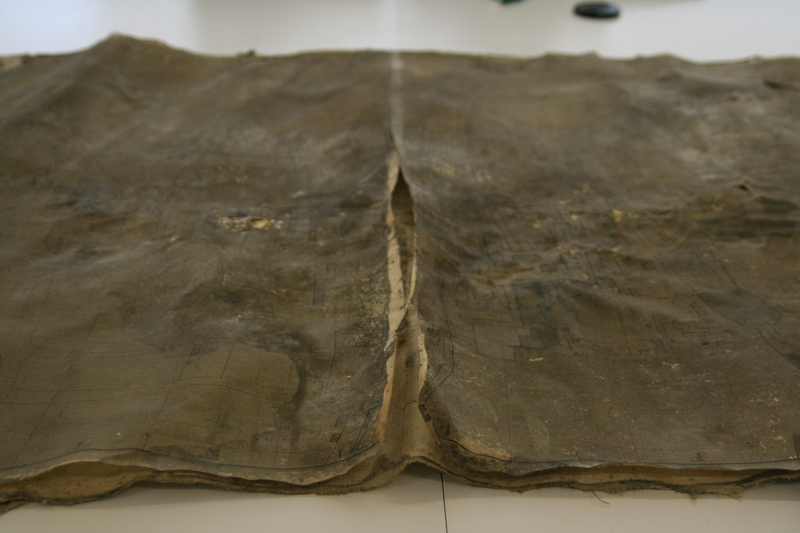 As part of the conservation work the map was stretched out after being humidified. This looks alarming but it mimics the original treatment process the parchment went through when new. After months of painstaking effort, the conservation work is now complete, and the map is due to make a special one-day visit to its home town for local people to come and see it. For your opportunity to see the original map and to find out more about its conservation, come to Saffron Walden on the Map at Saffron Walden Town Hall on Saturday 16 March, 10.30am-3.30pm, were ERO Senior Conservator Tony King will be talking about his work. There will also be talks from other experts about historic maps and how they were made. You can download a programme for the day here. After conservation work. The map is still very dark due to the layer of discoloured varnish which cannot be removed, but it has been flattened and tears and holes filled in. Despite the damage it has suffered, the outlines of the streets and buildings are remarkably clear. This entry was posted in Archives, Collections, Conservation, Essex history, Family history, House history, Local history, News and tagged conservation, events, map, Saffron Walden by admin. Bookmark the permalink.